The blue marlin bite is on! Almost all of the boats are getting bit daily but on average, more marlin are lost than are caught. Even with that, some boats are catching 2, 3 or even 4 marlin in a day. The spearfish bite is much the same with multiple catches. Just yesterday we caught a spearfish and I gaffed it. Normally I let the spearfish go but these people were feeding a large local family. Before I even got a chance to get a photo of it for my web site, we got a double spearfish bite. We got both to the boat and both were photo’d and released. One spearfish kept was more than enough meat. April is still technically striped marlin season but we’ve seen very few striped marlin this year. May is the peak black marlin month and though they are a fairly rare catch here, it’s a safe bet that there will be at least a couple caught next month. May also starts “blind strike” tuna season. Generally to catch the 100+ lb. yellowfin, you need to be working a porpoise school but May through the summer, you can be trolling along in the vast blue and all of the sudden, you’re hooked up to one or more 100+ tunas. It’s already started because it happened to one boat just 2 days ago. Ono season officially starts in May but the bite was good for ono all April long. April and May are the peak mahi mahi season months but few mahi were caught this month. We finally got F buoy back. That’s always been my favorite FAD (especially for mahi mahi) and it’s been missing for more than a year. It will take a few months to get some growth on it and start doing its intended job. It should be working in time for the fall mahi mahi season. The bottom bite was pretty good this month but that’s only because I found a new honey hole. My best honey hole has been invaded by little fish that pick my baits apart in no time. I’ve had to go to some of my older marked spots to find the fish but more times than not, there’s nothing there. I’ve known of a spot for many years that has some under water pinnacles but they’re in shallower water than I have ever bottom fished before. Usually, the more shallow the water, the more small pecker fish you have to deal with but one day I was running out of options and those pinnacles were near by so I decided to give it a shot. 2 sharks back to back, no waiting. The next time I went there, 3 sharks, no waiting. I fished there again yesterday. 1 huge shark caught and released and 2 missed bites. I’m sure the missed bites were not sharks. It just goes to show you that no matter how long you’ve been fishing and how well you think you got the game mastered, there’s always some new tricks to be learned. 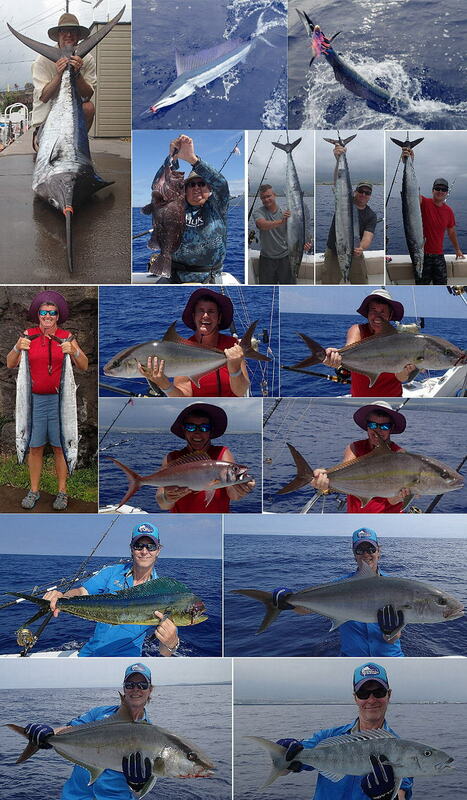 ← Kona Hawaii Fishing Report – March wrap-up.